"During November 1950 the First Marine Division with elements of two Regimental combat teams of the U.S. Army, a Detachment of British Commandos and some South Korean Policemen -- about 15,000 men -- faced the Chinese Communist Army's ten Divisions totaling 120,000 men. At a mountain reservoir called Chang Jin (we called it "Chosin") temperatures ranged from minus five degrees below zero in the day to minus twenty-five degrees below zero at night. The ground froze so hard that bulldozers could not dig implacements for our Artillery. The cold impeded our weapons from firing automatically, slowing down the recoil of our artillery and automatic weapons. The cold numbed our minds, froze our fingers and toes and froze our rations. [We were] seventy-eight miles from the sea, surrounded, supplies cut, facing an enemy whose sole objective was the annihilation of the First Marine Division as a warning to other United Nations troops, and written off as lost by the high command. "Ask any man that served at the Chosin, to be good a Tootsie Roll must be frozen!" "We put our seriously wounded in sleeping bags, and secured our dead to the fenders and hoods of the trucks. Those we had no space for we buried. Every Marine became a rifleman. Unable to build a fire to heat our rations the men were close to starvation. Destroying non-essential equipment, we discovered boxes and boxes of Tootsie Rolls, frozen solid from the sub-zero temperature. The Tootsie Rolls were issued to all the men. The sugar gave us energy and the candy satisfied our hunger. After two weeks of bitter fighting we finally reached the sea with most of our dead, our wounded, our equipment and one very important extra: 100,000 North Korean Civilians voting for freedom with their feet following us out. Some of them live in the United States today. 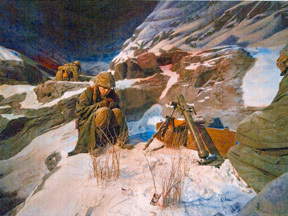 The 15,000 Soldiers and Marines suffered over 12,000 casualties, 3,000 killed, 6,000 wounded and thousands of frost bite cases.